Kaplan offers safe teething solutions while providing students with toys that promote fine motor and multiple sensory skills. 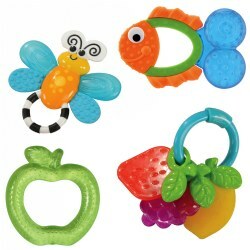 Products include soft shapes, rattles, stacking rings, and infant toothbrushes. 6 months & up. 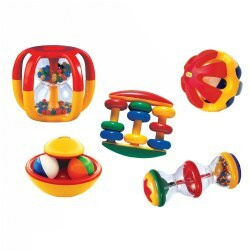 A set of activity rattles designed to develop senses through the introduction of color, shape, texture and sound. 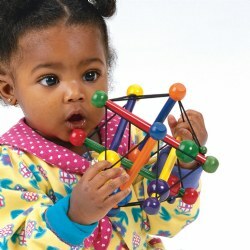 Encourages manipulative skills through grasping, holding, pulling, and turning. 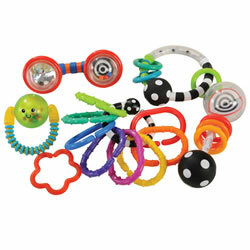 Includes Gripper Rattle, Shake Rattle, Roll Rattle, Rock and Roll Rattle, Abacus Rattle and Roller Rattle. 1 month & up. 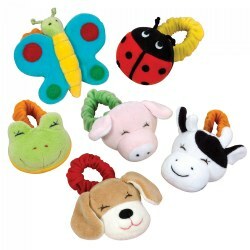 A selection of eight, brightly colored, chunky rattles easy for little hands to hold. 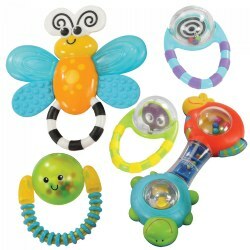 Each rattle is unique and does different things to keep the babies interested. 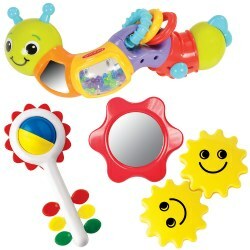 Whether it is chewing on the teether or watching themselves in the mirror, this set will be the one babies choose. Includes a handy storage container with locking lid and handle. Birth & up. This set of five paint-free toys promote visual and tactile stimulation through various textures and high-contrast colors. Contents may vary. Simply stretch the band and attach to infant's wrist or ankle and they can rattle away. Machine washable. 3 months & up. This set of cooling teethers will soothe babies while making them more conscious of oral sensations, encouraging language development. Items included may vary. 6 months & up. Play peek-a-boo, encourage crawling, build fine motor skills and stimulate a baby's senses, these toys will help in a child's early development and need for exploration in their young world. Contents may vary. 3 months & up. 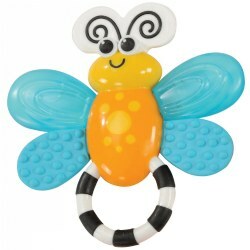 Flutterby teether has many textures to explore and a black and white handle that is easy to grasp. Filled with sterilized water, it can be chilled to help with baby's teething. Birth & up. 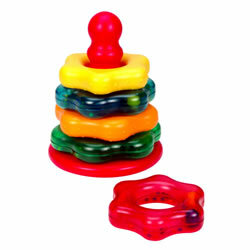 Colorful beads rattle and spin in one ring, big beads go clickety-clack on the other! In between is a friendly lion who entertains with every turn. Bright colors and high contrast are great for visual stimulation. 3 months & up. 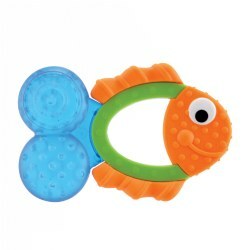 Multiple textures stimulate baby's gums and water-filled tail cools gums. Easy-to-grasp handle. Special shape helps reach baby's molars. 3 months & up. 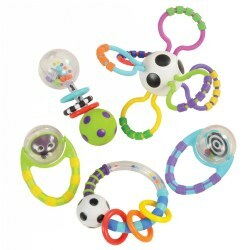 Explore this set of 5 rattles featuring bright colors, spinning balls, black-and-white contrast, and easy-grip handles. Birth & up. An adorable animal face has been added to this classic toy for an updated look. 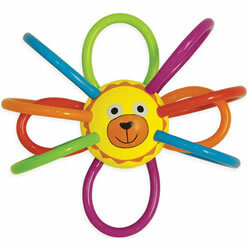 The tactile loops of tubing are spun into a shape that is easy for baby to grasp, shake and explore. Chill in refrigerator and the Winkell becomes a soothing teether. Birth & up. 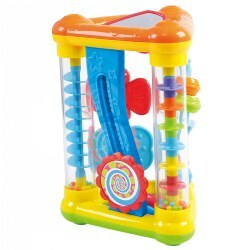 Babies love surprises, and this action-packed toy is full of them! This colorful toy entertains from every angle with colorful balls, beads, and butterflies--flip the triangle over and watch them all tumble down. Triangle has five sides with eight delightful activities for baby to enjoy with a soothing rainstick sound. This toy is easy to grasp for little hands. Measures 8 1/2"L x 6"W x 5 1/2"H.
3 months & up. 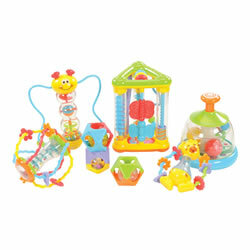 Invite babies to explore the many activities found in this set of five rattles. Features include bright colors, spinning balls, black and white contrast, and easy grip handles. Styles and Colors will vary. 6 months & up. 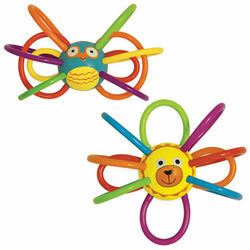 This sunny set of activity toys will brighten a baby's smile and stimulate a baby's senses. Contents may vary. Birth & up. A duo of adorable animal faces have been added to this classic toy for an updated look. 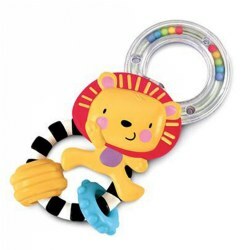 The tactile loops of tubing are spun into a shape that is easy for baby to grasp, shake and explore. Chill in refrigerator and the Winkell becomes a soothing teether. Set includes one owl and one lion. 6 months & up. Infants can explore the world of colors, sound, and texture with the many developmentally appropriate activities in this set. 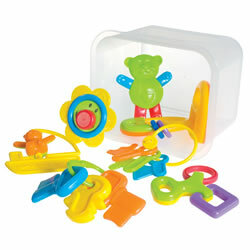 Each brightly colored activity will encourage active engagement while enhancing sensory and fine motor skills. 6 months - 2 years. Infants to toddlers will love this soft plastic ball with heart and arch cutouts and a surprise jingling bell inside. It encourages babies to stretch and crawl and toddlers to roll and catch. 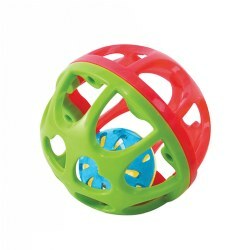 The ball is 4" in diameter and comes in assorted colors. 3 months & up. 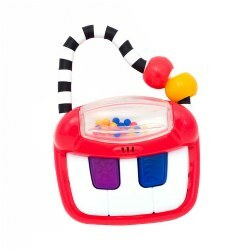 This baby-sized piano has musical sounds, shaking beads, and a handle for music on the go! Plays three different classical music songs when piano keys are pressed, teaching baby about cause and effect. The smaller keys light up when music plays helping to promote concentration. The movable beads on the handle help baby connect sound to sight. 3 months & up. 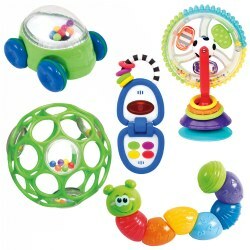 Little one's will love to play and discover with the Oball™ Clicky Twister Easy Grip Rattle and Flex & Stack Ball set. 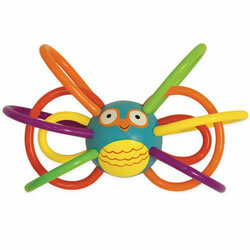 The Clicky Twister Rattle features Mini Oballs that connect for children to twist and click for a unique and fun sensory experience. 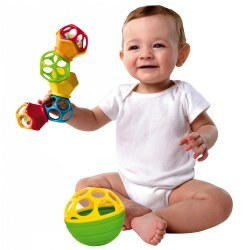 Babies can easily grasp, fold, nest, stack, and more with the soft 4" Oball™ Flex & Stack Ball. Rattle measures 2" x 4.25" x 7.5". 6 - 24 months. 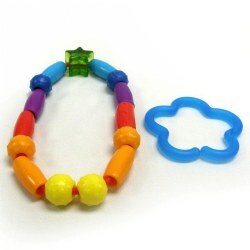 Bells ring, beads slide, and the elastic pieces spring into shape while little ones shake, press, stretch, and manipulate this toy! The Skwish appeals to your baby's visual and tactile senses, making this sophisticated toy a source of wonder and learning.